Home > Management Skills > What is Six Sigma? Six Sigma has been described in many ways: a business management strategy, a highly disciplined process, a statistical method, a data-centred approach, but what does all this really mean? This article won’t attempt to teach you Six Sigma, but it will provide some facts about Six Sigma, which should help you, as a manager, understand the term better when you next encounter it. Sigma (a letter in the Greek alphabet) is a statistical term for measuring the deviation of a process from the point of perfection. Perfection being that it has no defects or errors. The objective of Six Sigma is to identify and eliminated defects in a process. Originally developed for manufacturing processes, it can be applied to any business process, and is one of the most commonly used tools in business for achieving continuous improvement. Six Sigma can be applied to any process: for example to design or create a product, or the delivering or a service. Six Sigma focuses on achieving process improvements, striving to achieve as near to perfection as possible. This is often described as “zero defect”. Six Sigma Quality is when a process produces no more than 3.4 defects for every million opportunities. An opportunity is where there is a chance not to meet the required customer needs. Six Sigma consists of a collection of tools including: project definition, prioritisation, quality management, means analysis, variance analysis, hypothesis testing, cause and effective analysis and many others. Six Sigma was developed by Motorola to improve its internal procedures, and is a registered trademark of Motorola. Six Sigma consultants are referred to as “Black Belts”. This has been expanded to include Green Belts and Master Black Belts. What is a Defect? At its simplest, a defect occurs when a process fails to deliver what the customer wants. Inherent in the definition of Defect is the definition of Quality: Quality is what the customer wants. No more and No less. To understand the required quality is to understand exactly what the customer wants. Process capability is what the process can deliver. Variations are what the customer sees and feels. Stable operations build on the previous point, and focuses on improving the variations exposed to customers. The design of Six Sigma is to produce the most effective process to meet the needs of the customer and process capability. Six Sigma has both technical and management components. The technical components aim to improve process performance through process data, statistical analysis and methods. The five key stages are Define, Measure, Analyse, Improve and Control. The management components focus on ensuring the right projects get the necessary attention and the right people. Management should ensure, via the use of process metrics and project tracking, that objectives and quality targets will be achieved and that long term benefits can be sustained over time. Six Sigma is based on the principle that business success is dependent on reducing the amount of variation in the business process. Achieving quality improvements, that can be sustained into the future, can only be achieve when the entire organisation works together towards a common goal. 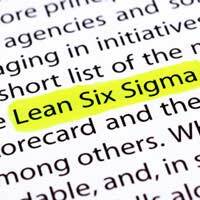 Six Sigma is used in a variety of organisations including General Electric, 3M, Dell, Ford Motor Company, Honeywell, Motorola, Samsung, Siemens, to name but a few. Six Sigma is a highly disciplined methodology that, where implemented successfully, has saved many organisations large sums of money. Its goal is simple: through the elimination of defects, or anything that makes the customer dissatisfied, the most optimised process can be achieved which leads to the most successful outcome. Numerous training organisations and training programmes are available covering certification in Six Sigma Belts as well as organisation wide education.